I am sure many of you have noticed when looking at your compost bins that there something new that maybe squirming in your compost and it’s most likely a Black Soldier Fly’s Lava. Actually, they’ve been around for ages. However, lately some of the attention they’ve been generating is quite new, especially with Garden enthusiastic. If you’re someone who raises chickens or you’re known as a “Backyard chicken rancher” you already know and most likely are already benefiting from Black Soldier Flies. 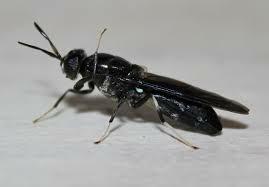 Black Soldier Flies are harmless to humans and pets, and helpful to the average organic gardener. I’ve taken some time to write about them here because most of your traditional gardening books lack basic information regarding them. Here’s a basic description of the BFS Larvae looks like. They’re natural color is very close to beige. They have dark color (brown) like rings around their bodies. The average size of the Larvae is approximately ¾ of a inch long, however, depending on what they are feeding on they may reach 1 inch length, as they are known to be very aggressive eaters, not uncommon for them to consume twice their body weight in a day. The Black Soldier Fly Larvae absolutely thrives in a damp environment. Together with decaying, nitrogen-rich organic matter only will only enhance the composting process. A warm environment will cause the BFS Larvae to be active within your compost. The BFS is so effective, you simply won’t notice pest like creatures, such as the common household fly or gnats in or around your Composting Bin. Did you know that BSF Larvae can be ground up and fed to earthworms or red worms for a second round or just used as compost. Their larva can be dried, is friable (edible), and is odorless. You’ll find that the Black Soldier Flies are common in the USA, and basically part of a large fly family or the Stratiomyidae family. Look at that lovely insect to the right. Doesn’t it resemble a small wasp with pretty black and white legs? It’s actually a Black Soldier Fly (Hermetia illucens.) Black Soldier Flies have made themselves quite at home in many a suburban compost, whether the compost bin’s owner is aware of it or not. You’ll find that the internet has generated quite a abuzz with ongoing discussions of “BSF” (black soldier fly) and the usages of their Larvae. Yet Soldier flies aren’t well known. That, no doubt, is because they lack the kind of annoying behaviors that make “housefly” and “mosquito” household words. You find many people who raise chickens, welcome Black Soldier Flies up to the point of even buying special growing chambers for these tiny creators. If you’re a Gardner, like myself you should be welcoming them as they have so many beneficial qualities. This might be a good time to mention the BFS cousin i.e., the Yellow Soldier Flies. Its scientific name is “Genus Ptecticus” and the Yellow Soldier Flies are also common in North America. 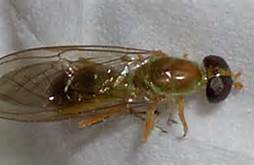 Even though they are smaller in size when compared to the BSF, they have a golden thorax, tan wings, hazel colored eyes, and short yellow antennae. The adult flies are timid and may look like some sort of wasp hovering or resting near the compost. Even with hundreds of Larvae squirming in the bin, only a few adult flies will be seen at any one time. Black Soldier Flies do not sting, bite and won’t bother you, like the normal common house fly. According to most sources, adult soldier flies do not feed at all. Most of their brief adult life is basically spent mostly on reproduction. The Black Soldier Flies normally lay their eggs near rotting material, animal manures and even kitchen scraps. The Black Soldier fly Larvae spend most of their initial life eating. After two weeks of devouring your compost you see that they will start to crawl out of material where they have been living and begin to work their way into some soil or dry matter. At this point they take on the form known as a “Pupa”. Emerging adult flies will have no trouble finding the compost bin to continue the circle of life. Adult soldier flies become inactive during cold months. It can be as easy as your morning cup of java. Absolutely, Black Soldier Flies love coffee grounds. If you’re new to composting and you would like to have them in your Compost, you can easily start a colony of them by adding coffee grounds to your compost. Collect a gallon or two of used coffee grounds and put them on the compost. Make sure the grounds stay moist. Dig into the grounds after a week and check for small tan wriggly “worms.” If you’re successful, supplement the herd by adding kitchen waste, more coffee grounds, or spoiled fruit or vegetables. The waste these Larvae make is very moist. This waste can be diluted into a compost “tea” to use in the garden, or help the breakdown of “brown” compost material. 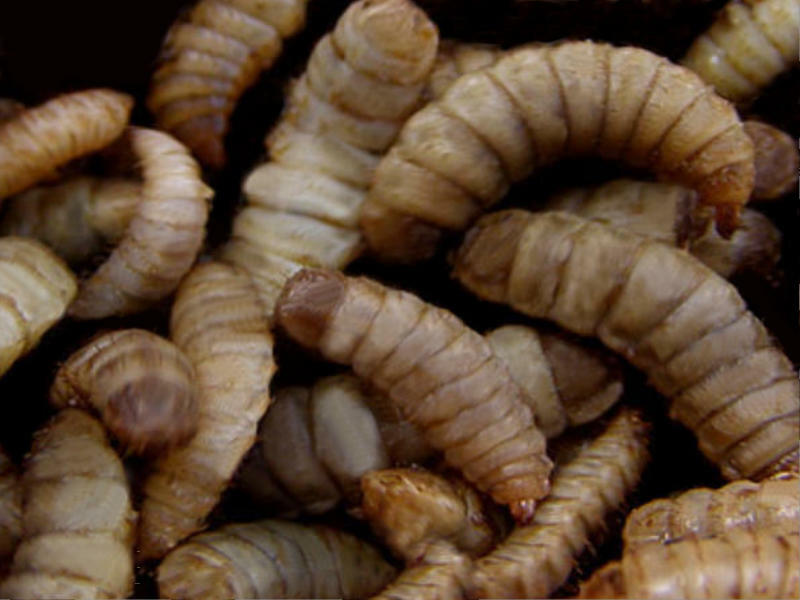 Black Soldier Fly Larvae (BSFL) make a nutritious “home grown” feed supplement as well a special treat for livestock. They contain up to 42% of protein and 35% fat. Black Soldier Flies can even help process the waste from the chicken bedding. Chickens can hunt the Larvae themselves, or chicken owners can buy or design special growing chambers for BSFL. These special chambers are made to capitalize on the larva’s natural instinct to crawl out of their food source when they have grown. Crawling larvae are then channeled into a collection bucket or bin. You can even design it so that the larvae will crawl right into the forging area of your chicken coop (if you have one). The fly larvae are very active, so active that they’ll make your compost bin soggy, warm, and in some cases slightly acidic. These are not ideal conditions for raising worms in a Worm Bin. If you raise worms you’ll want to play close attention in terms of the environment you maintain in your worm composting bin. Take care not create an environment that is conducive for the BSF. This means you’ll want to watch what you put in your worm bin in terms of nitrogen-rich waste, which will attract the Black Soldier Flies. Existing fly larvae can be lured into a feeding frenzy under moistened bread or cut open vegetables. Every few days I would recommend that you check your Worm Bins and if necessary remove any BSF Larvae that might have taken up residence. Remember, the BSF Larvae is an excellent source of protein for your animals. The adult soldier flies will not invade living quarters, and they do not carry harmful pathogens from where they originate from, meaning manure to food items. If soldier flies inhabit a compost, it is because they are exploiting a natural resource for them and speeding the transformation of waste to something that supports green plants. You might be someone who suffers an innate aversion to anything remotely “maggoty,” but the Black Soldier Fly Larvae (BSL) are harmless to you (humans) and domesticated animals as well. By now you should have a different opinion of Black Soldier Flies and their beneficial usage in your composting bin. They are a natural way of developing and maintaining efficient Composting Bin. The larvae will consume twice their body weight in day and will demolish all of your waste material and at the time will discourage the growth and/or development of normal house flies. After eating their fill, soldier fly Larvae crawl away to virtually disappear. The emerging adult BSF will be your source for laying new BSF eggs, which in term become a food source (both protein and fat) for your backyard livestock such as chickens and ducks. Nature recycling nature. Troy Brooks Managing Director for MyHeirloomSeeds.com Heirloom Seed Company. He together with his family have been homesteading, raising livestock and living Off-Grid on their Ranch in West Texas. He is also a Certified Master Herbalist and enjoying living a Self-Sufficient lifestyle. Invest in Rain Barrels – A SMART Financial Move! Thank you for you warm and favorable comments. It is much appreciated. I’ve receive several other comments regarding this subject as well. One of my future articles will be Fall Gardening-The Ultimate Long Term Food Storage. I have found bsf in my tumbling composters. Can I still tumble them, or would that hurt the larvae? I see larvae after winter, but no activity yet. Are they alive and waiting for warmer temperatures later in the summer, or are they dead? Thank you so much for posting this! I found the larvae in a tier of my worms bins that had become soggy and I freaked out. If you don’t know what they are, they can give you a fright for sure, especially if you see an adult looking all wasp-like! My chickens like to take a jump in the bins when I’m rotating them and we’re having quite the time munching the critters, so I deeply appreciate that you included the benefits of feeding them and lack of pathogens. Now I’m no longer worried and actually quite pleased. I have decided to keep a separate bin for them. Thank you for the information! I thought I had an infestation, now I see I have extra helpers! Thank you for this article. I’ve been wondering why there are so many large ‘maggots’ in my composting bin and I can definitely confirm that they are from a Black Soldier Fly. I’ve seen 2-3 of them near the kitchen door. True enough, they don’t really bother us like the normal house flies. Further, I’ve observed that my bin doesn’t stink like rotting vegetables and that the contents get lower and lower each time I open it (they might have been digesting the contents really fast which means I don’t have to dig another hole anytime soon). I’m really thankful that they graced my backyard. Now, I can have a happier garden and an efficient composting pit. If this is the answer to my 23 year question – why are these God awful things and why are they in my pristine compost bin? then my question is how to get RID of them? I don’t care what benefits they are suppose to have, I don’t like them, don’t want them, don’t have chickens to eat them, and certainly do not want to eat them myself. I have spent hours and hours hand picking these gross things out of my compost. Anyone out there who wants them can come and get them, just let me know and you can pick them out of my compost.